Bengaluru, 26th August 2018: The 5th edition of the Mulki Sunder Ram Shetty All India Basketball Tournament, organised by Vijaya Bank, witnessed semifinals action today at the Beagles Indoor Basketball Stadium, Malleswaram. The second semi final had the early tournament favourites Income Tax take on I.C.F Chennai. The game tipped off with both the teams trading baskets at regular intervals. Income Tax center Jeevanantham Pandi dominated the post with his amazing wingspan but P. Vijay of I.C.F kept the scoreboard ticking for his team with some nice mid range shooting. At the end of the first quarter, ICF still trailed 13-18. The 2nd quarter saw Income Tax take an early lead with some hard fought fastbreak layups from their top scorer G Sivabalan. Later in the quarter, K Jayavenkatesh of I.C.F turned down Jeevanantham Pandi with a huge block which shifted the momentum to their side and helped them cut the lead short. I.C.F turned up their defensive intensity causing Income Tax to make some bad passes but Income Tax still led 36-30 at the end of the first half. I.C.F started the 3rd quarter with a great shooting display from G.A. Anto Bethle but Income Tax maintained their lead with the help of some crisp passing from point guard Akilan Pari. 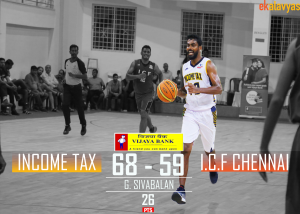 Income Tax faced a momentary setback when their big man Jeevanantham Pandi went down with an ankle twist which has been causing him trouble throughout the tournament but Sivabalan helped build up the lead for Income Tax finishing the quarter 55-38. The 4th quarter saw I.C.F regroup and scored some quick points to cut the 17 point deficit. Jeevanantham Pandi returned to the game and uplifted his team defensively with some game changing blocks which helped Income Tax maintain their lead and book a seat in the finals. The first semi final of the tournament saw the hosts Vijaya Bank take on the Indian Navy team who have been very impressive through the league stage remaining undefeated. Debutants Indian Navy have amazed everyone so far with their display of speed, energy and hustle whereas Vijaya Bank has heavily relied on their International players(Arvind Arumugam, Anil Kumar and Rajesh Uppar). 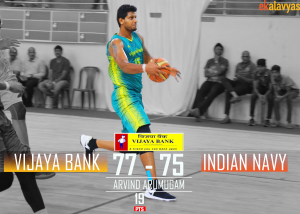 Hosts Vijaya Bank started the 1st quarter strong with an all round display from forward Arvind Arumugam who scored a couple of shots from the 3 point range and dominated in the post as well. But Vivek Goti answered in his own way with a huge slam on the other end which got things going for his team but they still trailed 15-24 to Vijaya Bank. The 2nd quarter started with Indian Navy immediately shortening Vijaya Bank’s lead with some great defensive stops. Gurvinder Singh Billa came in hot off the bench for Navy as he hit a three pointer on his first attempt, Mahipal Singh Bhati continued his good form and kept on driving to the ring on every opportunity possible and cut the lead down to just a single point trailing 39-40 at the end of the first half. Indian Navy started the 3rd quarter in their own way keeping Vijaya Bank from regaining the lead with their amazing speed on the court. Indian Navy point guard Mahipal Singh Bhati displayed some amazing hustle as he managed his to find his way to the ring on multiple occasions through the solid Vijaya Bank defense. Navy team center Vivek Goti got into his defensive groove and didn’t allow any shots for Vijaya Bank from under the ring which got them a 58-52 lead to end the 3rd quarter. The 4th quarter started with the momentum on Indian Navy’s side as they took an early lead in the first few minutes and Vijaya Bank kept on missing many shots from behind the arc. Arvind Arumugam took on himself to get his team back into the game as he managed to get fouled on consecutive plays while taking a lot of contact under the ring. With 2 minutes remaining in the game and a 7 point lead for the hosts, Indian Navy showed some amazing defense and hustle as they managed to get two clutch steals and converted them. Last minute of the game saw some amazing last minute drama as Indian Navy had a 75-74 lead with 30 seconds left in the game and Hareesh from Vijaya Bank managed to put back a missed layup from Arvind Arumugam and later Karthik managed to get a brilliant steal on the last possession of the game which sealed the win and a finals spot for the hosts. The final game of the league stage was played between Indian Customs, Pune and the Telangana State Team. Both the teams have already lost their first two league games and were out from the knockout stage but still fought hard to get their first victory of the tournament. Telangana team looked very energetic from the beginning of the game as their starting point guard Visu Palani opened the scores with a sweet reverse layup and later continued to score from behind the 3 point line as well. Palani had 10 points in the first half of the game. But former Indian team guard Siddhant Shinde from the Customs team wouldn’t be stopped as he continued his great scoring run in the tournament and made many shots from outside the arc as well as under the ring and thus providing his team a 19 point leading by the end of the 2nd quarter. As Customs started the second half of the game with a good lead they rested many of their starters but the Telangana team couldn’t matchup with the intensity of the Customs team bench as they were outscored 11-2 in the 3rd quarter. Eldho James of Customs kept the scoreboard ticking for his team and increased the lead to 76-39 at the end of the game.